In April 2017, TC was honored to be selected by Mayor Jonathan Rothschild as Tucson’s Poet Laureate. To read more about this two-year appointment, click here. 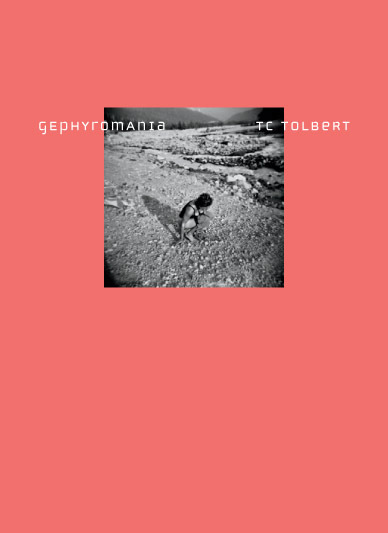 In Gephyromania (literally, an addiction to or an obsession with bridges), Tolbert’s choice isn’t between female and male, lover and self, or loss and relief, but rather to live (willingly, intentionally) in the places where those binaries meet. 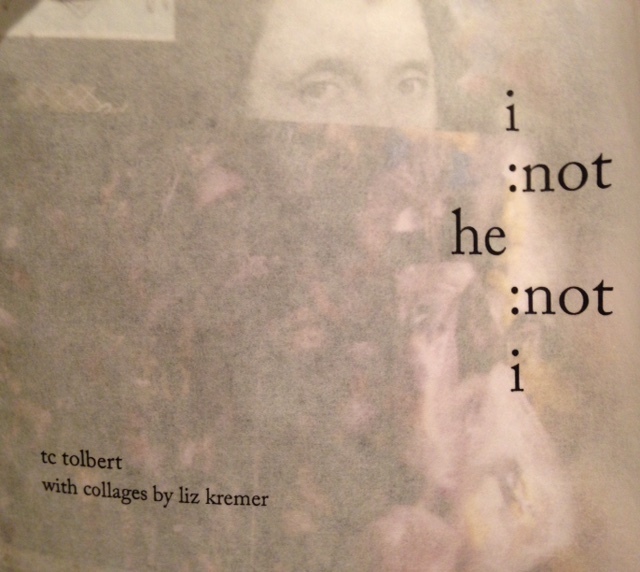 TC Tolbert’s i:not he:not i shows us what a singing, breathing body is. It offers a cyclical, careful examination of the tiny miracle-machines beneath the skin. i: not he: not i is dedicated to Stewball and MT. For love and letting go. 24 pages. Hand sewn. Cover letter pressed on craft card-stock. Colored collages by Liz Kremer. 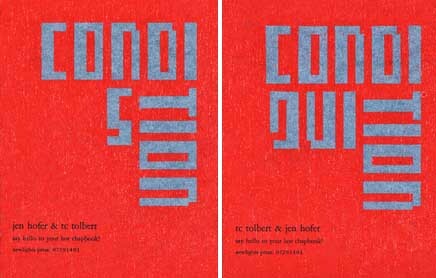 Conditions/Conditioning was made for a reading by Jen Hofer & TC Tolbert, the fourth in the Say Hello to Your Last Poem! series, on July 29, 2014, in Manitou Springs/Colorado Springs, CO. This book is a single-spine dos-a-dos, written in direct collaboration by the two authors specifically for the format, specifically for this publication. Corie Cole helped with proofreading, and CJ Martin & Julia Drescher helped with binding. The tension in TC’s poems pulls me in closer, the thought in them keeps me thinking, and their tenderness (relating both to pain and to an ultimate gentleness) opens and enlarges me, as I trust it will do for most of its readers. To read TC's interview about Gephyromania with Chelsey Burden, go here. To read TC's interview about reading at The Poetry Project in NY, go here. To see TC's reading at Dixon Place for Belladonna* click here. To hear TC Tolbert read at the Tucson Festival of Books, click here. 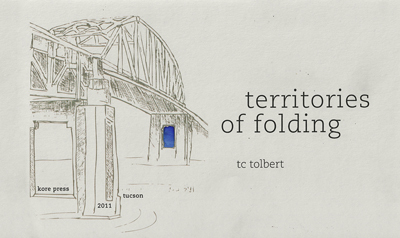 To see TC Tolbert and Movement Salon create a piece from territories of folding at the Tucson Lit Press Fest, click here. 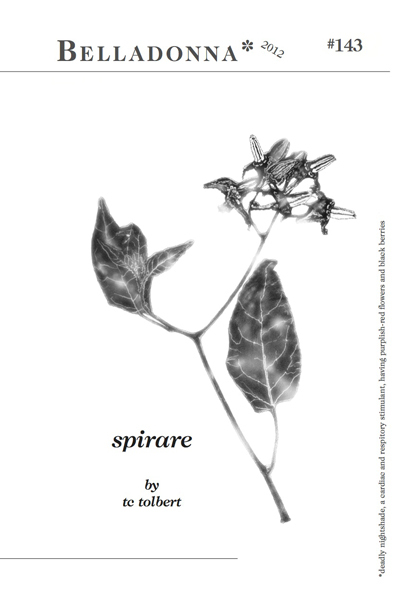 To see TC Tolbert reading new work at Casa Libre, click here.